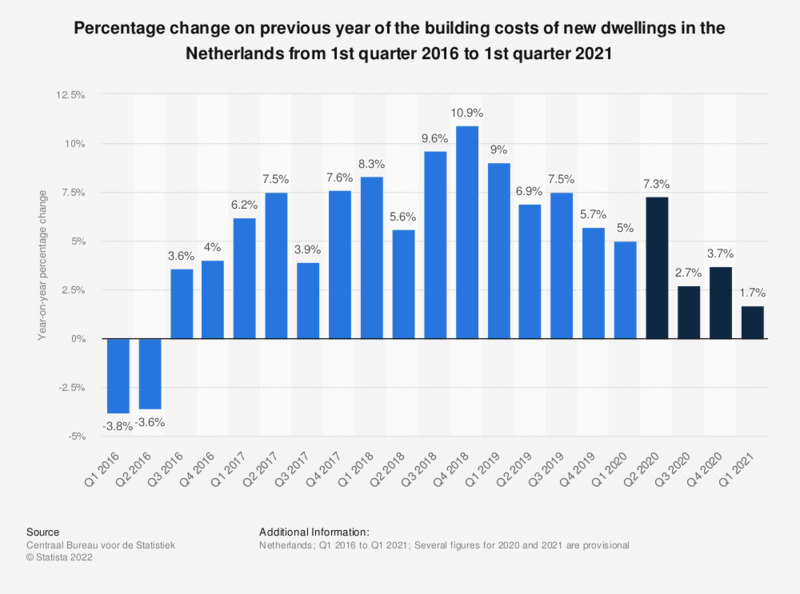 This statistic shows the percentage change on previous year of the building costs of new dwellings in the Netherlands from the first quarter of 2016 to the third quarter of 2018. In the third quarter of 2018, prices of building costs had increased with roughly six percent when compared to the same quarter a year before. Index value 2015 equals 100. The year 2015 is the base year used to calculate the index value. * The numbers provided are provisional. The source gives the following definition: "An output price index VAT included measures price changes of a finished good. In this case a dwelling. General costs and 'profit and risk' of the contractor are also included in this price index. This is in contrast to an input price index, which only measures the costs of the product itself (wages and materials)". The numbers listed concern changed compared to one year earlier and include VAT.